Southwark (/ˈsʌðərk/ SUDH-ərk) is the main part of the inner London Borough of Southwark. It is on the Thames, south of London Bridge. It is often called just 'The Borough'. Southwark was once a separate town in Surrey, and was made part of London in 1889. 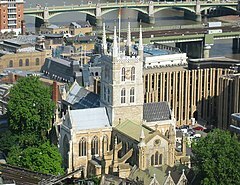 Southwark has several important buildings: Southwark Cathedral, London Bridge station and the Tate Modern art gallery. Two Roman roads met in Southwark: Watling Street and Stane Street. The area was marshy with islands in Roman times. They built the first London Bridge here. The word 'Southwark' is pronounced Suthuk. ↑ "Southwark", in The Columbia Lippincott Gazetteer of the World (1952), New York: Columbia University Press. This page was last changed on 20 July 2015, at 20:01.